The Classic Series 48 is a mid range single sided poster case or noticeboard designed for outdoor use. It can be wall or post mounted and has a robust aluminium frame with an acrylic header panel and 4mm toughened glass covers. Top lit illumination is available or the Classic Series 48 can be supplied unilluminated. 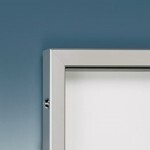 With a side hinged door for easy access to change graphics, the Classic Series 48 is a mere 48mm in depth making it ideal where a sleek unit is required or space is limited. Square corners give a neat design finish. The Classic 48 is available in a range of standard sizes and in almost any RAL powder coating. The interior is white with a magnetised back plate.